The 21st issue of the "Mongolica" magazine is dedicated to the 70th anniversary of the outstanding Russian mongolist Tatyana Dmitriyevna Skrynnikova. Before the revolution of 1921 the education in Mongolia was not clearly structured. But after the founding of the MPR the systematic creation of an education system began. Due to the large-scale cultural campaigns the level of literacy of the population increased from 5 % in the 1920s to 100 % in the 1970s. The article suggests the history of the descendants of the outstanding Russian Sinologist, the Buddhist V. P. Vasilyev up to the eighth generation, i. e. to the great right of the right, inclusive. And the article is a supplemented and mostly amended version of the report "Academician V. P. Vasilyev and his descendants: a sketch of the genealogical tree" read on April 4, 2018 at the All-Russian Scientific Conference "Academician V. P. Vasilyev (1818—1900 ) as a researcher of the culture of China, Tibet and Mongolia. On the 200th anniversary of his birth", which was held at the Institute of Oriental Manuscripts RAS. St. Petersburg. Published in the same year. In this article the main emphasis is on analysis of Jasaγ concepts: evolution of meaning of this concept in the XIII—XVII centuries when the Mongolian chronicles which recorded the using of a concept in political culture were composed. The analysis of the Mongolian texts showed that the Jasaγ concept developed from designation of the occasional order of the Supreme ruler to organizing of the ruling structure subordinated to the ruler. According to the sources, we can speak about the beginning of formation of the Mongolian statehood. The article is an analysis of elements of legal procedure in the Mongol Empire of the first half of the 13th c. by the example of trail on Fatima Khatun — favorite of Turakina, regent of the empire. Accusation in witchcraft and encroachment on the member of the ruling family caused court examination of the high level, with participation of Guyuk Khan himself. 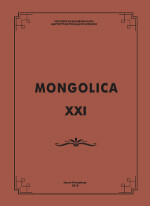 Author analyses information of sources on trail on Fatima as well as additional materials on court and legal procedure in the Mongol Empire, attitude of Mongols towards the witchcraft and punishment of sorcerers, He founds that examined case is a valuable addition to our idea on organization of justice in the empire of Chinggis Khan and his nearest successors and at the same time reflects specific features of legal procedure on such cases as witchcraft against members of khan’s family. The article is devoted to a preliminary survey of the paleographical peculiarities of a singular seventeenth century manuscript, the Erdeni Tunumal Neretü Sudur. It presents the description of letters and graphic elements of the manuscript according to the scheme offered by D. Kara in his monograph Books of the Mongolian Nomads. The analysis of the handwriting of the manuscript suggests that it can be attributed to a single scribe, who, probably, did not have a professional status. The publication presents the author's translations of the Kalmyk folk cumulative tales, and provides a brief analysis of the features of this genre in the folklore of Kalmyks. This article describes Kalmyk musical instruments that are stored at the National Museum of the Republic of Kalmykia named after N. N. Pal'mov. Based on the well-known system of E. Hornbostel and K. Zaks, Kalmyk musical instruments are classified into brass (aerophones), strings (chordophones), membrane (membrane) and self-sounding (idiophones). This paper deals with a newly re-found scroll in Tibetan that belonged to the 18th century acquisitions. The scroll was supposed to be inserted into a prayer wheel or another cult object. It consists of 27 separate leaves that contain Buddhist sacral formulae, the four variants of block prints being represented, and two randomly taken folios of some Tibetan books, at least one of them relating to the Kagyu Order of Tibetan Buddhism. Four analogous leaves with sacral formulae are found in another item — a bundle of separate leaves that was also acquired by the St. Petersburg Academy of Sciences no later than 1798. These leaves were most probably taken out of the scroll considered. Since two of them are marked with a special black stamp that was used at the Library of the Academy of Sciences until the middle of the 18th century, we can be quite sure that this scroll was one of the very earliest acquisitions of the Tibetan texts in St. Petersburg. There are about hundreds of written sources on the Oirat clear letter devoted to the cult of fire in the manuscript collections and libraries in Russia, Mongolia and China. In Kalmykia, the work dedicated to the cult of fire is found for the first time. When Tung-hu found out that Mao-tun had taken the rule of Hsiung-nu, they demanded several requisitions. These stories were developed into legends and later were reflected in «Djangar» epic songs. Thus, folklore has a historic value. The article is written by the eminent Buryat scholar Badzar Baradi Baradiyn (1878—1937) in the beginning of 1930-s when the translations of selected works of V. I. Lenin into modern Buryat language were planned to be published in Buryat-Mongolian Autonomous SSR. In the scope of this project Baradiyn, being the leading specialist in Buryat language and literature composed a paper on the methodology of translation. He exposed the theory of translation in the form of practical guide for translators. According to his conception ideal translation must make impression of an original text. The paper contains also the assessment of Lenin’s literary style. The original text of the paper is kept in the Baradiyn’s collection of the Orientalists’ Archive of IOM RAS. The paper is published for the first time.